Nothing says holiday more than a glass of egg nog. There are so many different variations from using cream vs. milk, adding alcohol vs. non-alcoholic, or using raw egg yolks or to temper them. There are definitely a few different ways to make it. Also, I feel that there seems to be a love/hate relationship with eggnog. Seems like people either love it and buy tons around this time of year or are scared of it. Most people immediately think of drinking raw eggs, which is common…. not that I blame them. I never really drank it much because of the fat content from the yolks and heavy cream. So this year I wanted to try to make a skinny version that was low in fat. 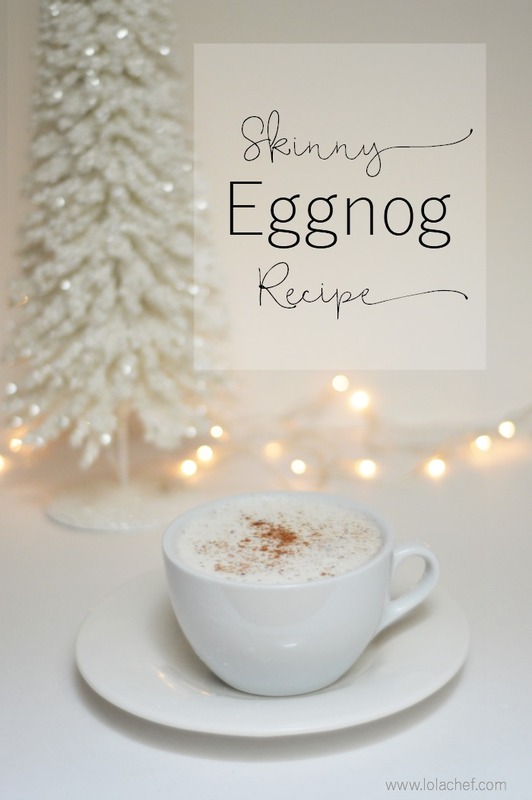 I needed to make a skinny eggnog recipe. So, I started researching what goes into classic eggnog. Mainly egg yolks and heavy cream or whole milk and obviously nutmeg. A lot of recipes temper the whipped egg yolks and surprisingly some people still use raw eggs. I would NOT recommend using raw eggs (especially if you are serving to guests!) So I had to find out how much you can cook an egg to kill bacteria but not cook it into a solid or scrambled egg….hmmmm. What you want to do for egg safety is to slow cook it while whisking until it reaches 160 F. This temperature will make it safe to eat. When tempering the egg, it may only reach 125 degrees. I like to play it safe. I decided to use egg whites and a combination of a small amount of light cream and fat-free half and half. I also used meringue powder, which can be used in some recipes as an egg white substitute. This helped give it a smooth and fluffy texture. Meringue powder is optional, I tried without and the recipe still worked. Basically, what I did was whisked up egg whites with sugar in a small saucepan for a few minutes, then added meringue powder, cream, spices and half and half. I attached a baking thermometer to the pan and whisked while it cooked to temperature. I was able to get it to 185 degrees F without it overcooking. It may be tricky to separate the egg whites, using a tool like Stainless Egg Separator really helps to avoid any risk of having egg shells in the eggnog. I always separate into a small bowl before adding to the pan. 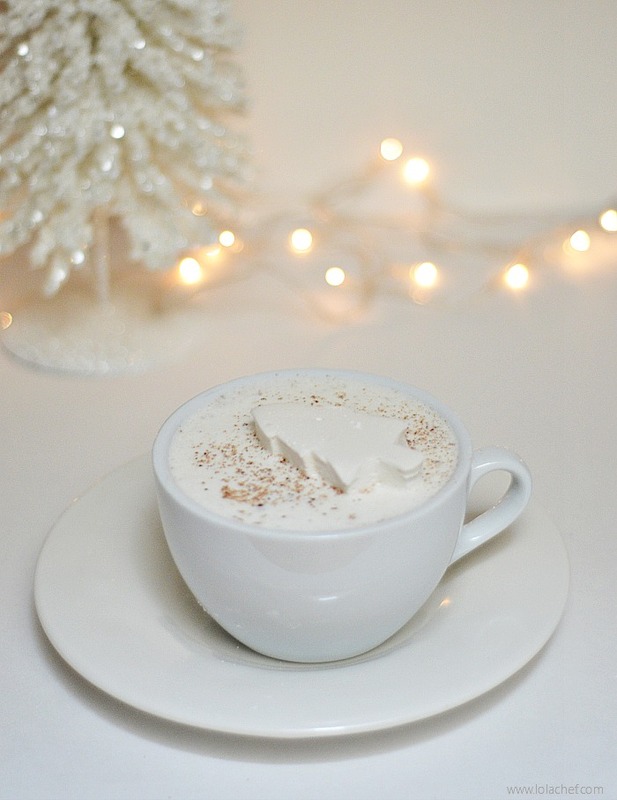 A light version of classic eggnog. In a small saucepan whisk egg whites for a few minutes until frothy. Add sugar, meringue powder, cinnamon, nutmeg, vanilla, cream and half and half. Whisk together, attach a candy thermometer and place stove top heat to medium. Continue to whisk while heating. Carefully watch the temperature rise while whisking. You want the temperature of the mixture to reach 160degrees F at least, I was able to bring it to 185 degrees F without it cooking too much. Once it reaches temperature, remove from heat and place pot in a ice bath or cold water. I filled one half of my sink with cold water and submerged the pot so that the water reached halfway up the sides of the pot. This will help stop the cooking. Pour mixture into a pitcher and chill in refrigerator for a few hours. Once chilled whisk eggnog before pouring, and sprinkle top with nutmeg. Add alcohol if desired. If the eggnog becomes too thick after chilling add additional half and half or cream. Whisk before serving. 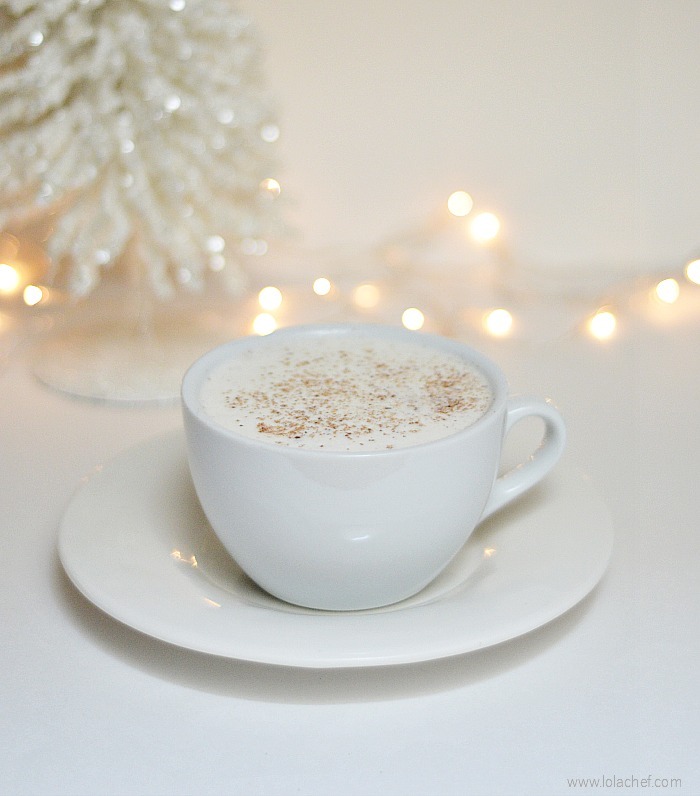 A light and skinny version of eggnog. In a large pot whisk egg whites for a few minutes until frothy. Add sugar, meringue powder, cinnamon, nutmeg, vanilla, cream and half and half. Whisk together, attach a candy thermometer and place stove top heat to medium. I make a non-alcoholic version so anyone including the kids can enjoy it as well. I like to have alcohol on hand for adults to add, such as a rum, bourbon or whiskey. You can top with whipped cream or a festive homemade marshmallow, then sprinkle even more nutmeg. *this post contains affiliate links for helpful products I recommend. See Recipe for Homemade Marshmallows. It sounds delicious! I will have to try it for the holidays. Yum! I have to figure out how where I can get meringue powder.